This section is dedicated to odd bits of information relevant to new or prospective MX5 owners, in the form of a series of short articles in no particular order and this will be regularly updated. If you have ever owned an old MG or Spitfire, you’ll remember what a carry-on it was to use the soft top: awkward to raise and lower and very drafty. I’m happy to say that the MX5’s hood is a joy to use with one minor caveat. Its easy to lower and raise and the design is so good that it should keep the interior of your car warm and dry even in the heaviest rain. Lets take a quick look at the variety of soft-tops fitted to MX5s. The most basic one is fitted to the Mk1 model and is made from vinyl with a plastic rear window. This does the job nicely and if looked after should last a good 10 years. The soft top fitted to the MK2 was little nicer as it has a proper glass heated rear window which does away with the inconvenience mentioned later on. And yes, it is possible to fit a hood with a glass screen to a Mk1 with the only downside being that its quite expensive. Next along is the mohair hood which was fitted to some of the special edition models and again this can be retro-fitted to the Mk1 and Mk2 and really adds a touch of class to an MX5. Again, quite expensive though. The only other slight complication is colour. Most MX5s use black hoods but some of the special editions are fitted with hoods in either tan, blue, green or burgundy. When its time to replace your soft top, its worth considering a coloured one: for example, a dark blue car fitted with a blue hood can look spectacular. There is a specific technique to lowering the soft top and failure to adhere to this can highlight the Achilles heel, which is the plastic rear screen. First you should undo the two catches (above the windscreen): this relieves the strain on the zip. Then unzip the rear screen, letting it lay flat on the rear deck. If you don’t do this, the plastic rear screen will fold over on itself as the roof is lowered and will eventually crack and break. In cold weather, the rear screen gets very brittle indeed and will crack like a piece of glass, so you need to be very careful indeed. To erect the hood, pull it up into place and zip up the rear screen before fixing the catches into place. Occasionally, a vinyl soft top may sag slightly over the warmer summer months. The simple solution is to re-tension it using the adjuster found on the underside of each of the front catches. So whats it actually like to drive an MX5 with the top down? Well for starters, its quite a different car compared to driving with the top up. Sounds and noises change and not always in the way you might think. The various minor creaks and rattles and other typical convertible noises suddenly disappear to be replaced by a little more wind noise (though not much) and you can concentrate on a decent engine/exhaust note. Better still, you can hear and even smell what’s going on around you, making you much more aware of your surroundings. MX5s have really good heaters so open-top driving even in the winter months is possible and as far as I am concerned, its an essential experience. We get lots of very cold winter’s days up here in Northumberland when the sun still shines brightly and the roads stay dry and its excellent fun to put on a silly hat and drive, top down. Some people moan about the backdraft sometimes experienced in the cockpit and this can be cured by fitting a windblocker, a simple screen that fits behind the seats and stops the wind blowing you about. A hard top can be a nice addition over the winter months. Again, different versions are available with the most desirable being a genuine Mazda item as this tends to be of a fairly high quality and will have a glass heated rear screen. Various aftermarket hard tops have been produced over the years and of dramatically varying quality. For example, I’ve come across a number of fibre-glass models complete with Perspex rear screen and while these are not the best fit, they are very light and therefore ideal for a use on a track oriented car. All but the earlier Eunos/MX5s will have most of the necessary wiring in place in order to connect a heated rear screen though sometimes you may need to buy a switch or a relay to complete the job – it depends on what the car left the factory with. On a similar vein, not all MX5s left the factory with everything required to actually fit a hard top either. You need the two odd shaped fittings on the rear panel (in front of the boot) known as Frankenstein bolts (due to their shape) and the two brackets on the inside of the car, positioned just behind and to the side of the rear seats – these can all be found both new and secondhand for little money. Once fitted, the benefits are obvious. The car is around 5 decibels quieter for a start plus a lot warmer and visibility is improved thanks to a proper and larger rear screen. One other very welcome benefit is that a correctly fitted hard top adds to the structural rigidity of the car which is always a good thing. The downsides of a hard top are simply that it’s a bit cumbersome to store safely and that removing it in a hurry is tricky. One final point about hard tops: they are always in demand which means they hold their price nicely. Buy one now (usually £300 -£500) and you should get every penny of your money back when its time to sell. Prices are low over the summer and tend to rocket in the run up to winter. Can you ever have too much power? Clearly many MX5 owners don’t think so as the internet is full of discussions about tuning the MX5. I’m not going to try and cover everything here – its simply a huge subject – but let me at least mention the easiest jobs worth doing. Before you start spending money, its worth thinking about just how you currently drive your MX5. Take a look at the rev counter and you’ll see that the red line is set at around 7000rpm. So the first question is, when do you change gear? Very few owners change gear at much past 4000 rpm which means that by simply hanging on and changing gear nearer the redline, you’ll gain about 50% more power and you’ll be travelling a damn sight quicker. I know your in-built mechanical sympathy means you might wince at the thought of that but an MX5 engine (presuming that its well maintained) is designed to be worked hard – in fact it should rev to 7500rpm with no problems. The ECU has a safety cut-out that kicks in at around 7250rpm to prevent over-revving anyway. I once read that the theory is similar to opening a door: opening it fully will no more wear out its hinges than just opening it a little. So the easy way to go faster is simply to make everything work harder, much as Mazda intended. The next issue to consider is the kind of power you actually want. Maximum bhp is often produced at the top end of the rev range which is fine if you are going to regularly drive as mentioned above. However, this is not much good if you want a bit more grunt when pulling away from a roundabout in third or fourth gear. You need torque rather than outright BHP – just take a drive in any modern diesel to feel what a huge difference in day to day driving this makes. This small modification costs nothing and makes a noticeable difference to everyday driving. Very simply, on Mk1 models, the ignition timing can be advanced from its usual 10 degrees Before Top Dead Centre to around 14 degrees BTDC. This gives extra low down torque while still producing more bhp at the top end and the difference is certainly quite noticeable. The benefit can be even greater if you are willing to run on super unleaded petrol though its not strictly necessary. It’s a fairly easy modification to carry out and I know from my experience that its well worth while. A quick search through the MX5 Owners Club or MX5 Nutz forums will tell you how to do it. There’s two parts to this one. Very simply its all about getting air into the engine and exhaust gases out, as quickly as possible. The first part of the equation is the intake system. Its relatively easy to replace the standard air filter and box with an aftermarket performance filter. You need to be a little careful though as some of the cheaper ones simply make lots of noise and do nothing for actual performance. Even the better ones will usually simply move some of the power around within the rev range rather than make a huge difference. Even so, its worth thinking about if you are prepared to buy decent quality parts such as those produced by K&N, Racing Beat or HKS . A real gain can be found by simply feeding your intake system with cooler air. Air that’s cooler is also denser which means there’s more of it, and we want as much air in as possible remember. The golden rule is that for every 7 degrees Farenheit that you lower the intake air temperature, you should see a 1% increase in power. So theoretically, dropping the air intake temperature by 35 degrees F should give another 5% more peak power – that’s an extra 5-6bhp. So a performance air filter is a good thing while one combined with an extra source of cold air (such as a headlight lid vent) is a very good thing indeed. The standard exhaust system can also be improved nicely too. There are two reasons for wanting to do this, with the obvious one being more power but a major benefit is a nicer sound. I know that sound can be very subjective but a decent system can sound wonderful and you really shouldn’t under-estimate how much a finely tuned exhaust note can add to the whole driving experience. There are three parts to exhaust modifications and I’m going to ignore the last one as it tends to get expensive and complicated and that’s the exhaust manifold. The standard manifold is a well designed four-into-one system and replacement gives only the smallest gains in power. So lets talk about the exhaust from the catalytic converter backwards. This consists of an intermediate pipe followed by a silencer and decent replacement performance stainless steel systems start at £200, add around 4-5bhp and sound lovely. Some of the more expensive systems, and I’m thinking of some of the duel exit systems in particular, can sound absolutely superb and offer a massive increase in exhaust gas flow. The system itself is a doddle to replace by the way, and should take less than half an hour. The next part of the system we should talk about is the catalytic converter. This really kills bhp and replacement with a bypass pipe makes a big difference. However, it will almost certainly cause problems at MOT time though I know many owners simply re-fit their cat converter just to get through the MOT and then swap back afterwards. Not very PC and almost certainly illegal but it happens a lot. The other issue worth bearing in mind when replacing the cat converter with a bypass pipe, is that the resulting loss of exhaust back pressure means less low down torque, though top end power is definitely better. I recently drove a Eunos 1.6 that had a home-made cat converter bypass pipe fitted along with a cheapo big bore performance exhaust. When put on a dyno, it produced an impressive 120bhp (and this was on a 20 year old car). However it was pig to drive with no mid-range grunt at all. It just shows how important it is to carefully choose and use good quality parts – a message that can apply to pretty well all aspects of MX5 tuning. Even so, there are reasonable gains in power to be made here, certainly enough to substantially improve the performance of your ‘5’ with little effort. 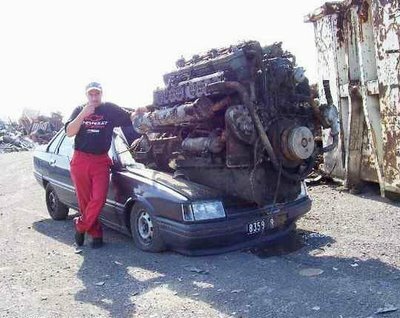 To turn your MX5/Eunos into a seriously quick car, you need to either supercharge it or fit a turbo. Its another huge subject, way beyond the scope of this website so I'll just touch on a few basics based on my own experiences with forced induction cars. First of all, you need to start with a car that has a good bodyshell. Its pointless throwing loads of money at a good conversion kit and then bolting it onto a rusty car. Next, its going to be expensive. 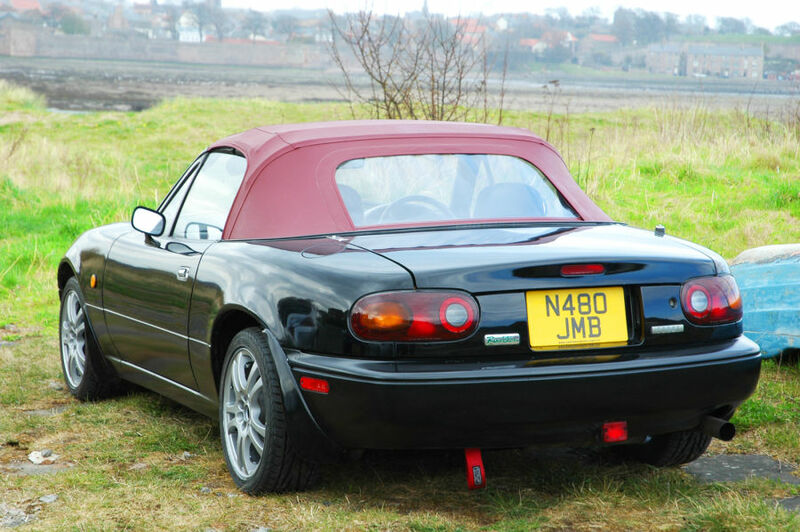 Yes you may hear about some bright spark who reckons he's turbocharged his MX5 for £700 but unless he's some kind of genius, its just not going to happen. The key to supercharging/turbocharging is not so much making as much power as possible but rather making a powerful and reliable car. There are all sorts of home made kits available on Ebay etc but realistically, you need to buy good quality kit. For example a cheap Chinese turbo exhaust manifold will crack as soon as it gets hot while something of quality by a company such as Flyin Miata is substantially more expensive but also of substantially better quality. Realistically, its going to start at £1500 minimum for a conversion done on a DIY basis and closer to double that if someone reputable does the work. So is it worth it? Well its easy to achieve 200bhp with a half decent set-up and more with not much more expense and effort. The standard engine and gearbox are fine up to 250bhp-ish but after that, we're into engine rebuild territory with forged pistons etc. Its all about the power to weight ratio so a standard 1.6 gives around 118bhp per ton. However a decent turbo set up should easily give 200+bhp per ton and then we're into BMW M3/Subaru Impreza/Lotus Exige territory then. Expect a 0-60mph time of 5 seconds or so, though I know from experience that acceleration beyond 60mph is even more exhilarating. Another way of looking at it is: what car could you buy for this kind of money that offers comparable performance? There's not much out there.